Have you ever wondered how many hours of the day you spend sitting? Modern people sit for long hours, compared to people living in days gone by. Exercise will naturally adjust a crooked back, but sitting in a bad posture for extended periods will have long-term repercussions on your lower back and body. The office chair I’m now sitting on is rickety, so I decided to get a new one before my productivity dropped. 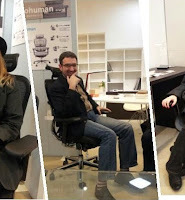 The other day, I went office chair shopping with a friend who was also looking for a new one. After a while one chair felt like the next – I sat on so many– but I could discern one that ill matched my physique the moment I sat into it. The chair I found most comfortable was quite functional, but it came with a price tag to match. But we mustn’t spare the expense when it comes to our health, should we?